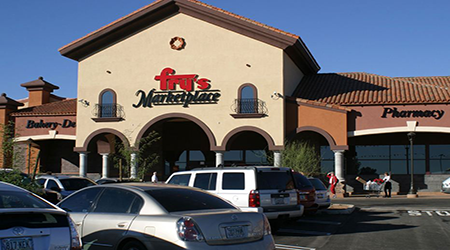 The Mayor and Tucson City Council voted this week 6:1, with Councilman Steve Kozachik the sole dissenting vote, to approve an amendment to the Houghton East Neighborhood Plan that could allow for the development of a 124,000-square-foot Fry’s Marketplace at Houghton & 22nd on a 16-acre site at the northeast corner of South Houghton Road and East 22nd Street. 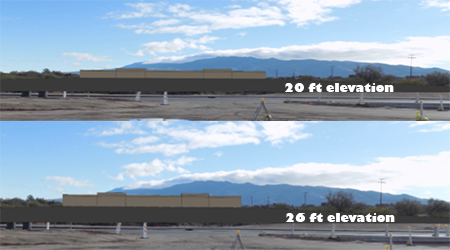 The amendment allows for the building to be 26 feet tall, instead of the 20-feet limit stated in the original 1985 plan developed when the City annexed the area, a two-square mile area bounded by Speedway on the North, 22nd Street on the South, Houghton on the West and Tanque Verde / Melpomene Way on the East. The necessity for the additional 6 feet lies in the fact that Fry’s needs a mezzanine for offices. To minimize the height elevation, the developer is proposing a declining elevation from 26 feet to 22 feet in construction. The two grocery stores that were recently vacant have both been re-occupied; first, the Safeway at Broadway & Houghton was sold back to Safeway from Haggen and will be re-opened, and second, the former Basha’s at this same corner has been repurposed to an upscale movie theater concept with restaurant and bar included, recently leased by Craig Finfrock of Commercial Retail Advisors. Even with approval of the changes for the proposed site, Brentwood Development still needs to go through the rezoning process before it can build the shopping center, which also includes a gas station and two smaller retail buildings. It has already been eleven months since the public meetings started with the neighborhood and individual home owners; rezoning will be at least another 9-months and probably more before the rezoning is approved or possibly denied. 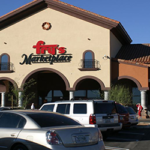 Everyone wants a Fry’s Marketplace nearby to shop, or one would think, as evidenced by more than 100 people attending the council meeting Tuesday night for this agenda item. Mayor Rothschild counted speaker cards as 38 speakers in favor, and 17 speakers opposing the amendment. Neighbors living within doors of each other met there, one in favor, one opposed, as they voiced opinions for 90 minutes. At issue it became clear is amending a 30-year-old neighborhood plan document. The Eastside Neighborhood Plan states that it is appropriate for this corner to be used for commercial uses and allows C-1 zoning with a height restriction of 20 feet. There has already been precedence set that approved an increased building height of Walgreens at the northeast corner of Broadway and Houghton to 35 feet. Comprehensive planning which dictates public policy in terms of transportation, utilities, land use, recreation and housing typically encompasses a large geographic area to cover a long-term time horizon. But no comprehensive plan should be intended for three decades without modifications. Plan Tucson is updated every 10-years by Arizona Statute, to reflect changing priorities of the community as they evolve physically, economically and socially over a decade. But not neighborhood plans that apparently never have to be updated, only amended when progress runs into opposition. When a conflict between the City Plan, approved by voters last in 2013, and a neighborhood plan arises, which has higher authority? You would think the obvious answer is the City Plan, however this wasn’t apparent at the meeting this week. As Plan Tucson states: ‘City government plays an important role in determining the business climate. Economic Development Strategic Priorities, as adopted by the Mayor and Council in early 2013 include Business Recruitment, Retention and Expansion, as well as Investment in Key Commercial Areas’. It appears a new Fry’s store and retail center that brings 300 jobs, 175 new jobs, would meet such a stated economic goal for the City. As pointed out by one passionate union member, ‘these are good union jobs being brought to the community, Fry’s is a good company to work for’. As so often is the case at these public hearings, many speaking against the project were residents from outside the boundaries of the neighborhood. Councilwoman, Shirley Scott noted that some of the people opposing the project live inside the buffer zone for the Saguaro National Forest, the property being amended is well outside this one-mile buffer zone. Councilman Paul Cunningham, after noting his surprise with the large number of supporters at the meeting, motioned to approve the amendment but told the developers, “It’s far from a done deal.” This project is in Councilman Cunningham’s Ward 2. We shall continue to follow the progress of this project for our readers and urge a quick resolution for the greater benefit of the neighbors in Houghton Eastside Neighborhood and Tucson at large, as well as the developer ready to invest $30 million into our community. To view Houghton Eastside Neighborhood Plan, January 13, 2016, Pubic Hearing click here.